Isotope exchange between dalargine applied onto various supports [glass, activated carbon, few-layer graphite (FLG)] and molecular tritium, performed with activation on a tungsten wire and on 5% Pd/C, 10% Pd/C, and 5% Pt/FLG catalysts was studied. Depending on the experiment conditions, the molar radioactivity of [3H]dalargine varied from 0.47 to 31 Ci mmol−1 with activation on a tungsten wire and from 0.63 to 5.5 Ci mmol−1 under the conditions of heating to 335 K in the presence of noble metal catalysts. Significant difference in the tritium distribution between amino acid residues of the peptide depending on the support and on the activation method is observed. Reactions of tritium atoms generated on tungsten led to the tritium incorporation mainly into aliphatic acid residues upon application of the peptide onto glass and into aromatic residues upon application onto activated carbon. 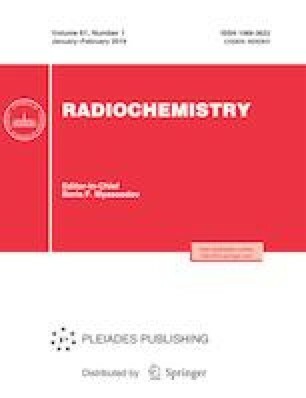 The use of FLG as a support influenced the tritium redistribution between aliphatic and aromatic residues to a lesser extent. Upon tritium activation on 5% Pd/C, 10% Pd/C, and 5% Pt/FLD, tritium was mainly incorporated into aromatic residues, which is typical of electrophilic reactions. The study revealed strong effect of the support on the mechanism of the isotope exchange of hydrogen for tritium in dalargine. The intramolecular distribution of tritium in preparation of labeled compounds using thermal activation can be controlled by properly choosing a support onto which the substrate is applied.